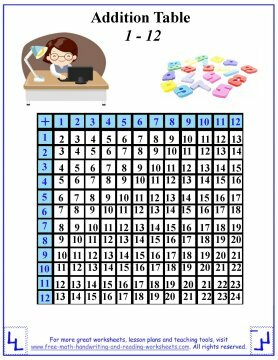 An addition table is an excellent tool for teaching your child about all of the addition facts from one to twelve. It lays out all of the possible addition problem combinations from 1+1 to 12+12 with the exception of adding zeroes. I cover that in another lesson which you can find below. Using the table, you can clearly see the numbers laid out and the relationship between them. Click on the picture to print your own table. Once you've printed it out, you can use it as a study guide along with the worksheets below. Using the table is a lot like plotting points on a map. To find the answer to any addition problem simply place a finger on each number and where they come together is where you will find the answer. If your child has ever played "Battleship" then he or she will know how to work the table. As mentioned earlier, the table covers all possible number combinations from one through twelve. For more help with these addition problems, I've created some printable fact sheets. 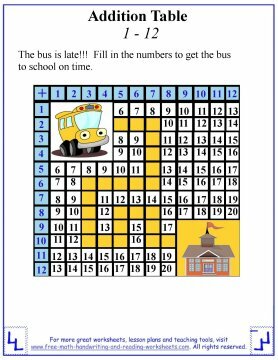 You can print yours out when you check out my lesson covering basic addition facts. I made a few mazes for our daughter using the table. She's pretty into mazes at the moment--it's best to use what interests your child when trying to teach them new things. 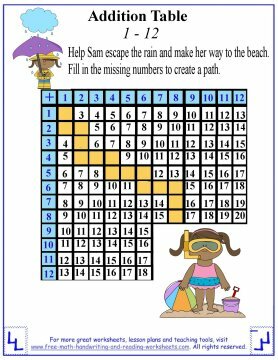 The mazes are pretty simple, the path is already marked out, your child just needs to fill in the blanks with the correct number. Be sure to have your child say the problem out loud or maybe even write it down on another sheet of paper before filling in the blanks. Repetition is a good thing especially when trying to learn basic addition. All of the activity sheets follow the same basic principle. 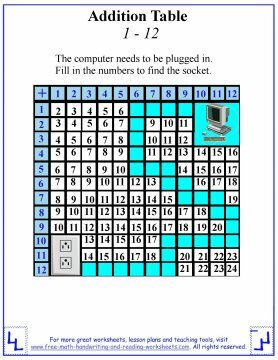 Get from point A to point B by filling in the missing numbers. 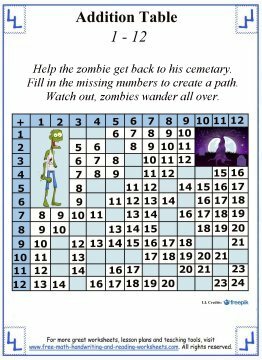 Most of the worksheets follow a simple up, down, left, right pattern with the exception of the zombie worksheet. 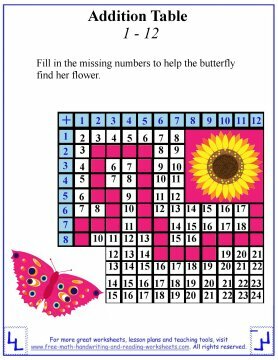 I felt that it might be too easy to fill in the numbers if children were simply progressing forwards or backwards all of the time. That is, however, part of what is so nice about the table. You can see the logical progression of numbers clearly as you move up and down or left to right. But, I hope to challenge students a bit more with the Halloween-themed activity as children can move diagonally as well. 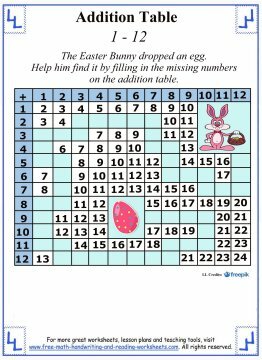 Be sure to check out the related lessons below for more help with addition and fun math games.